An approximate timescale of key Permian events. 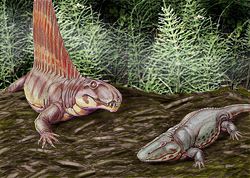 Two carnivores of the lower Permian: Dimetrodon (left), a mammal-like "reptile," and Eryops megacephalus, (right), a semi-aquatic amphibian. The Permian period is an interval of about 48 million years defined on the geologic time scale as spanning roughly from 299 to 251 million years ago (mya). The period is noteworthy for having most of Earth's land mass collected into the single super-continent, Pangea, which provided the forms of life with vast areas of dry or seasonally dry land, but, in comparison with the preceding Carboniferous period, provided greatly reduced swampy lands and coastal margins. The fossil record of the Permian period holds the first modern trees (conifers, ginkgos, and cycads), as well as a number of important new insect groups, including the Coleoptera (beetles) and Diptera (true flies). The Permian period saw the development of a fully terrestrial fauna with the mammal-like "reptiles," the Pelycosaurs diversifying to include both the first large carnivores, such as the finbacked Dimetrodon, and the first large herbivores. The Permian, the last period of the Paleozoic era, is followed by the Triassic period of the Mesozoic era. The boundary between the Permian and Triassic periods is etched indelibly in the geologic record as Earth's most severe mass extinction event, the Permian-Triassic extinction event (P-T or PT) in which during the so-called Great Dying some 90 percent of all marine species and 70 percent of terrestrial vertebrate species went extinct. The Permian period and the Great Dying laid the foundation for the appearance of dinosaurs and mammals in the Mesozoic era that was to follow. The three primary subdivisions of the Permian period, from youngest to oldest, are the Lopingian epoch, the Guadalupian epoch, and the Cisuralian epoch. These are presented below, along with the faunal stages, also from youngest to oldest. The faunal stages refer to subdivisions of rock layers based on the fossil record. Additional age/stage equivalents or subdivisions are given in parentheses. Epoch and age are designation that refer to time, while the equivalents series and stage are designations that refer to the rock layers. During the Permian, all of Earth's major land masses, except portions of East Asia, were collected into a single supercontinent known as Pangaea (or Pangea). Pangaea would break apart during the Triassic and Jurassic periods of the Mesozoic, separating into Laurasia and Gondwana (or Gondwanaland). 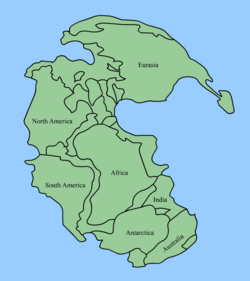 In configuration, Pangaea is believed to have been a somewhat C-shaped landmass that spread across the equator. The body of water believed to have been enclosed within the resulting crescent on the East side has been named the Tethys Sea, while the vast ocean surrounding the super-continent of Pangaea has been named Panthalassa (the "universal sea"). Large continental landmasses create climates with extreme variations of heat and cold ("continental climate") and monsoon conditions with highly seasonal rainfall patterns. Deserts seem to have been widespread on Pangea. Sea levels in the Permian remained generally low, and near-shore environments were limited by the collection of almost all major landmasses into the single continent Pangaea. One continent, even a very large one, has less shoreline than six to eight smaller ones. This could have in part caused the widespread extinctions of marine species at the end of the period, by severely reducing shallow coastal areas preferred by many marine organisms. Three general areas are especially noted for their Permian deposits: the Ural Mountains, China, and the southwest of North America, where the Permian Basin in the U.S. state of Texas is so named because it has one of the thickest deposits of Permian rocks in the world. Permian marine deposits are rich in fossil mollusks (ancestors of both clams and squids), echinoderms (ancestors of both starfish and sea cucumbers), and brachiopods (present as fossil shells similar in appearance to the sea shells commonly found on beaches). The fusulinid was an abundant single-celled organism during the Permian period. Its shell, shown here in cross-section and considerably enlarged, grew in an expanding spiral pattern that changed so significantly over the fusulinids' 80 million years on Earth that the fossilized shells are used as a geological marker for Permian strata. Fossilized shells of two kinds of marine invertebrates are widely used to identify Permian strata and correlate between sites: fusulinids, a kind of shelled amoeba-like protist that is one of the foraminiferans, and ammonoids, shelled cephalopods that are distant relatives of the modern nautilus. Terrestrial life in the Permian included diverse plants, fungi, arthropods, and various types of four-legged amphibians and reptiles. The dry conditions of the continental climate would have favored gymnosperms, plants with seeds enclosed in a protective cover, over plants such as ferns that disperse spores and require the presence of water for fertilization to be achieved. The first modern trees (conifers, ginkgos, and cycads) appeared in the Permian. The Permian began with the Carboniferous flora still flourishing. About the middle of the Permian, there was a major transition in vegetation as the swamp-adapted lycopod trees of the Carboniferous, such as Lepidodendron (an extinct tree-like plant related to the club mosses) and Sigillaria, were replaced by the more advanced conifers, which were better adapted to the changing climatic conditions. Lycopods and swamp forests still dominated the South China continent, apparently because it was an isolated continent and it sat near or at the equator. The Permian saw the radiation of many important conifer groups, including the ancestors of many present-day families. Rich forests were present in many areas, with a diverse mix of plant groups. The Permian period saw the development of a fully terrestrial fauna and the appearance of the first large herbivores and carnivores. Permian tetrapods (four-legged vertebrates) comprised both amphibians (classified into three groups) and reptiles (also classified into three groups). The amphibians comprised the temnospondyli (a diverse group of small to large and highly successful amphibians adapted to a variety of terrestrial, semi-aquatic, and marine habitats), the lepospondyli (generally small amphibians occupying specialized and limited niches), and the batrachosaurs (reptile-like amphibians). The reptiles comprised the sauropsids (from which the dinosaurs, as well as today's turtles, snakes, lizards, and crocodiles are descended), the Pelycosaurs (which became extinct during the Permian period), and the Therapsids (whose descendants surviving until the present are the mammals). The Pelycosaurs and Therapsids are sometimes grouped together as the synapsids. Early Permian terrestrial faunas were dominated by Pelycosaurs (including the finbacked carnivorous Dimetrodon) and amphibians, the middle Permian by primitive therapsids such as the Dinocephalia (whose diverse herbivorous, carnivorous, and omnivorous forms included some weighing up to two metric tons; and the late Permian by more advanced therapsids such as Gorgonopsians (the top carnivore) and Dicynodonts (widely successful tusked herbivores ranging from rat- to ox-sized). Toward the very end of the Permian period the first archosaurs appeared. They embodied changes that reduced the weight of the skull, secured the teeth more securely to the jaw, and permitted attachment of more muscle to the leg bone. During the following Triassic period, the archosaurs would evolve into more advanced types, eventually into dinosaurs. Also appearing at the end of the Permian—from the therapsid line—were the first cynodonts, which are considered to have been ancestors to the mammals, which appeared during the Triassic period. Another group of therapsids, the therocephalians (such as Trochosaurus), arose in the Middle Permian. A number of important new insect groups appeared at this time. These included the Coleoptera (beetles) and Diptera (true flies). The Permian ended with the most extensive extinction event recorded in paleontology—the Permian-Triassic extinction event. About 90 to 95 percent of marine species became extinct, as well as 70 percent of all terrestrial organisms. On an individual level, perhaps as many as 99.5 percent of separate organisms died as a result of the event. Geologically coincident with the extinction event, one of the largest volcanic eruptions of the last 500 million years poured out basaltic lava forming massive flood basalts spread across a great swath of present day Siberia. The close correlation with the extinction event suggests the eruption may have contributed to environmental stress leading to the mass extinction. The reduced coastal habitat and highly increased aridity probably also contributed. Another hypothesis involves ocean venting of hydrogen sulfide gas. Portions of the deep ocean periodically lose all its dissolved oxygen, which allows bacteria that live without oxygen to flourish and produce hydrogen sulfide gas. If enough hydrogen sulfide accumulates in an anoxic zone, the gas can rise into the atmosphere. Oxidizing gasses in the atmosphere would destroy the toxic gas, but if the quantity of hydrogen sulfide would great enough, it could consume all of the atmospheric gas available to convert it. Then hydrogen sulfide levels would increase dramatically over a few hundred years. Modeling of such an event indicates that the gas would destroy ozone in the upper atmosphere, which could then allow ultraviolet radiation to kill off species that had survived the toxic gas (Kump et al 2005). Of course, there are some species that can metabolize hydrogen sulfide. An even more speculative hypothesis is that intense radiation from a nearby supernova was responsible for the extinctions. Trilobites, which had thrived since Cambrian times, became extinct before the end of the Permian. In 2006, a group of American scientists from Ohio State University reported evidence for a possible huge meteorite crater (Wilkes Land crater) with a diameter of around 500 kilometers in Antarctica. The crater is located at a depth of 1.6 kilometers beneath the ice of Wilkes Land in eastern Antarctica. The scientists speculate that this impact may have caused the Permian-Triassic extinction event, although its age is bracketed only between 100 million and 500 million years ago. Hoffmann, J. H. “When life nearly came to an end.” National Geographic 198(3): 100-­113, 2000. Kump, L. R., A. Pavlov, and M. A. Arthur. “Massive release of hydrogen sulfide to the surface ocean and atmosphere during intervals of oceanic anoxia.” Geology 33 (2005): 397-400. Ogg, J. Overview of global boundary stratotype sections and points (GSSP's). International Commission on Stratigraphy (ICS) 2004. Retrieved September 24, 2007. This page was last modified on 14 November 2008, at 19:03.